The Glen Club Hole 1: The opening golf hole is a straightforward driving hole with the only real danger lurking on the second shot where the bushes pinch in on the left near the bottom of the hill. The green is deep and undulating. The Glen Club Hole 4: This short par three plays downhill and has an amphitheater feel to it. The green is not large and has significant breaks, but short siding oneself, especially in a bunker will make up and down real tough. The Glen Club Hole 5: This picturesque long par five features a fairly generous driving area, but the large lake can present trouble on the second shot and definitely is a true hazard on the approach as it snuggles the left side of the green and then wraps around the back. The green also has quite a few subtle breaks that make putting tough. The Glen Club Hole 6: This long dogleg right has strategic bunkering at the corner of the dogleg and also across the fairway on the left. The green is also well guarded with back-right pins being very tough to get close to. The Glen Club Hole 7: This monster of a par four has OB left and requires two mammoth shots to reach the green. The putting surface appears large, but with the bunker right and a large fairway slope to the left, the entry to the green from any long shot (most will be) is no more than 10 yards wide, which means hitting the green will be very tough. The Glen Club Hole 8: After the long 7th hole, this short 8th hole is a breather, right? Wrong! Although this par four is short and downhill, the fairway is very tight and has bunkers and the lake left and bunkers and long fescue to the right. The green is guarded by a bunker and more water and runs away from the player. The Glen Club Hole 11: The good news on this long par three is there is plenty of room to bailout to the right. Also, any pin to the right of center is also not too bad. However, any pin left of center is purely crazy as it is over water and bunkers the whole way. To make matters worse, there is a large tier that separates left from right and putts coming down that tier from the upper/right level are tough to stop. So, just hope the pin is cut right when you play. 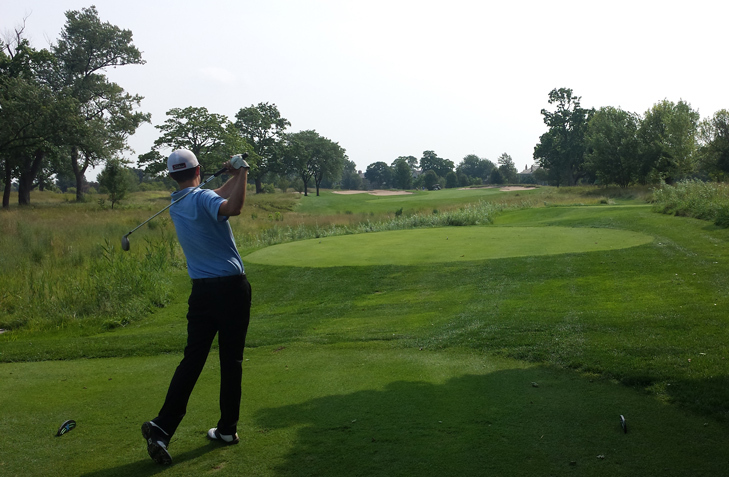 The Glen Club Hole 15: The best framed drive on the course is on this short, dogleg left par four. The fairway is really tight and a drive needs to snake its way between over or around the bunkers on either side of the fairway. From there, the approach is close to the easiest on the course, so this offers a good chance at birdie. The Glen Club Hole 17: Another tough but fair par three, the obvious trouble is the lake short and left of the green. The player, however, can bailout a mile to the right and leave a chip that, although downhill, is possible to negotiate. The Glen Club Hole 18: Simply put, don't mess with the lake on this par five, as it'll ruin the score to end the round, and is very much in play on the second and third shots.